I thought it was about time I gave you a little beauty room tour, this is actually out third bedroom which I’ve managed to claim for myself! 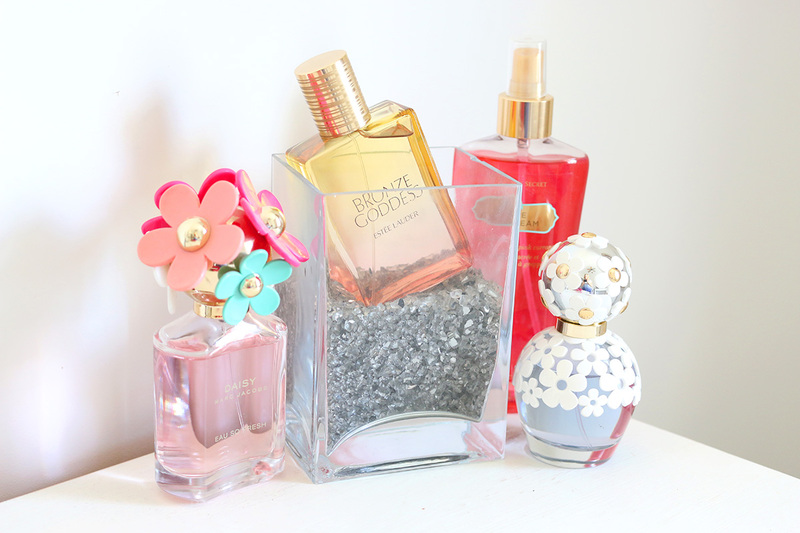 I’ve turned it into my beauty room and this is where I keep most of my makeup and where I get ready in the morning. It’s not quite where I want it to be right now as I’d like to add some extra touches like photos and pretty things but until I find the exact pieces I want I’m just going to wait it out and live with what I have so here it is, I hope you enjoy this picture heavy post! First up is my huge chest of oak drawers that I actually hand painted myself, I gave this a makeover a little while back now and think it’s super pretty. If you’d like to see the original makeover post and how I achieved it using Annie Sloan paint you can read that here. So in these drawers I keep quite a lot of beauty items, such as tanning products, new in items, I also have a magazine drawer and of course a camera equipment drawer! I desperately need to sort everything out in here but it’s such a mammoth task I keep putting it off, I need to buy some drawer oganisers from Ikea so I can really get myself organised and have a specific placed of everything as it’s currently all just shoved in there and I don’t quite know where everything is, at least my Cocoa Brown tan is easy to find hey girls! Next to those drawers is a mini bedside table, this also has drawers in it and I recently painted this to match. It doesn’t have anything inside at the moment because I’m waiting to organise everything. 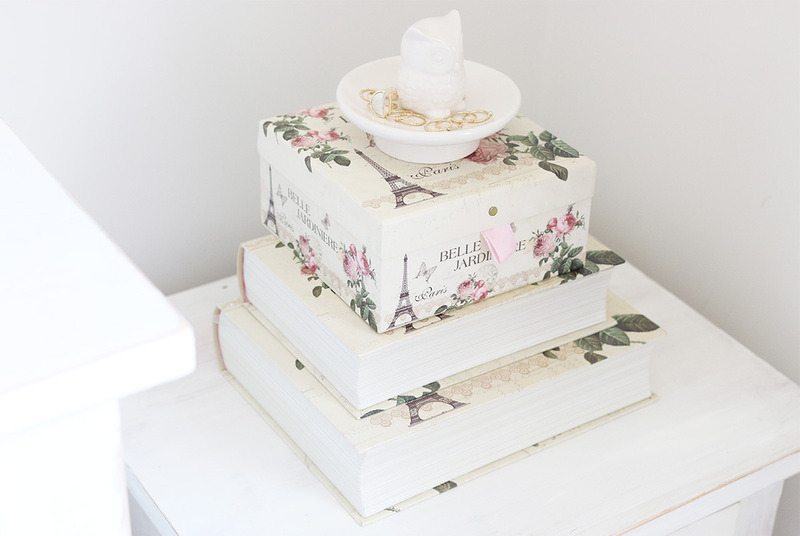 On top are just some faux books, I say faux because they are actually storage boxes! I keep things like lashes in here and random bits and bobs, on top is my little owl ring dish which I think is super cute. Both Items I believe were from Dunelm or a shop similar they were bargains I remember. 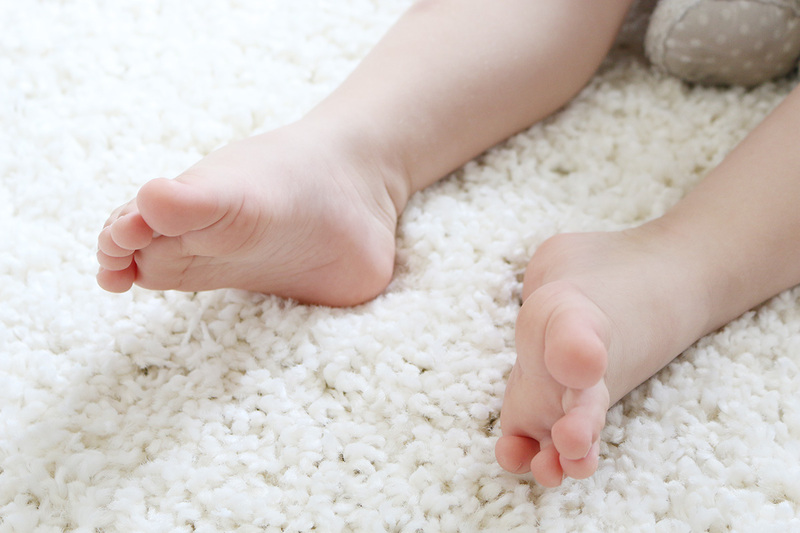 I recently added a rug to this room, as you can see the carpet is a light brown but I like everything to look as bright as possible so this white shaggy rug from Carpetright fits in perfectly and it’s so soft. Vinny actually loves to sit on here whilst I get ready in the morning, he always says ‘ohhh soft mummy’ it’s so cute, we often come up to this room to read stories on the floor and have a snuggle too! We have actually carpeted most of our house with carpet from Carpetright, the quality is really great and I’m so glad they now offer a brand new range of rugs you can always guarantee great quality from there and we have not been disappointed with this rug I now need an extra big one like this for the lounge because it’s so cosy. 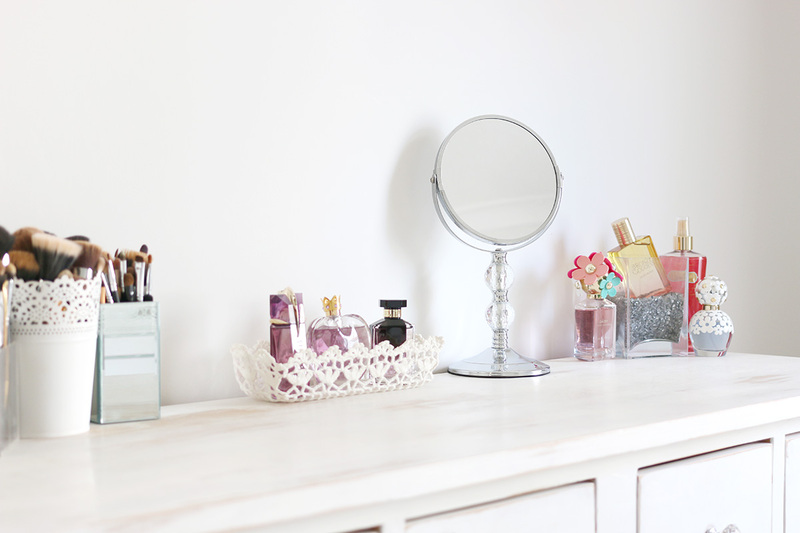 Final part of this room and the most important is my vanity area, I did write a whole post on this a few months back which you can read here, you can also see many more pictures and details on it via that post. 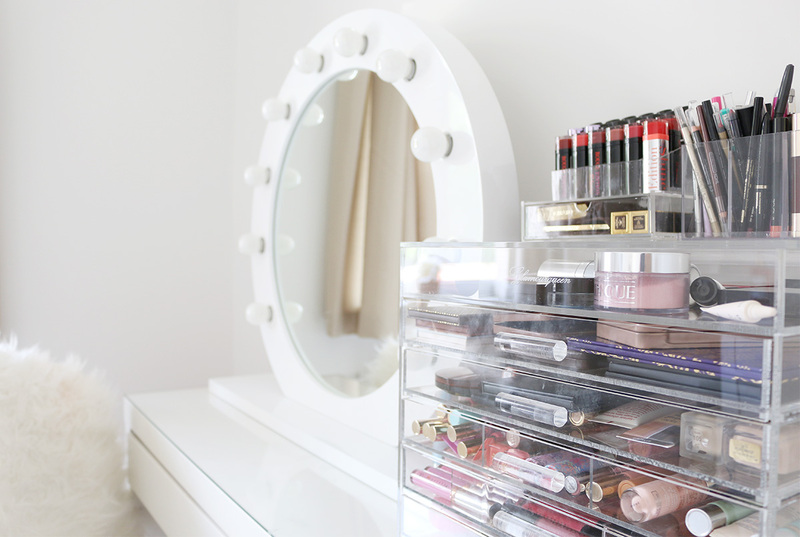 I really love my vanity area and I feel so lucky I have this space and storage for all of my makeup, it’s a bright and fresh area that I adore! What do you think of my beauty room so far? I shall have to do an update post once it’s complete.